Despite the statistics proving out its regularity in American culture, I know very little regarding the feeling of a marriage falling apart. Growing up I was surrounded by marital success, with grandparents that spent nearly their entire lives together until fulfilling their vow of death do them part and parents that currently celebrate anniversaries worthy of admiration and recognition, and while I can't put any official stamp on my own relationship with my wife, we are approaching a decade since taking that enormous step and I don't see any reason for pessimism regarding our future. I was instantly fascinated by the film A Separation not because of the subject matter, because let's face it, a narrative focused on divorce is not exactly ground breaking for cinema, but rather because of something as simple as a static camera and the way it frames its subjects. We look upon these two people from the perspective of a judge as he listens to their arguments centered around their potential divorce and the always bitter battle for custody of a child. Their mannerisms and body language and the way their words are delivered with passion, its impossible not to buy in. Within minutes I had already let my guard down and I ceased to view this man and woman as merely characters living inside a piece of fictional cinema, and this sets the table for the entire experience. We are the judge and we witness the good and the bad, the truth and the lies, and we weigh their actions with our own moral compass. Often times when I fall in love with a movie, I will gush about its cinematography or I will get lost in the melodic, majestic score, but not so here. It isn't that the film did anything wrong on any technical level, it didn't, but when it all boils down it is the craft of writer-director Asghar Farhadi and the across the board brilliant performances from the cast that have me inspired by its seemingly effortless and flawless execution. When a single person is able to put pen to paper and pour their soul onto the pages, resulting in a screenplay that feels almost too good to be true, and that very same person has such a confident and precise ability to deliver on their vision, it's truly inspiring to watch it all unfold. 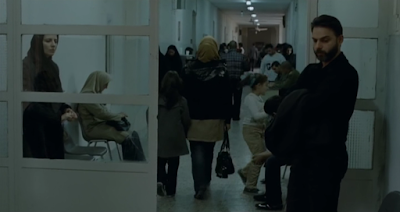 Prior to this screening of A Separation, I was unfamiliar of the talents of Farhadi, but it was quickly clear I was watching something special and he is obviously the most vital reason as to why. Every single member of this cast should be applauded for their ability to take the words they were given and not only bring them to life, but do so to such an extraordinary level that you could feel the pulse of every angry exchange, every quiet moment of contemplation, every tear that fell from their eyes. A Separation is bursting with life and realism throughout, featuring characters that are so damn human it practically hurts. Farhadi deals us a fair hand because no bias is shown at any point. We aren't weighed down by an overbearing message or phony, exaggerated characterizations to push our opinions in either direction, but rather we empathize with the very real people on display dealing with very real hardships and its left to our own morality and our own conscience to decide how we might react under similar circumstances. A Separation isn't about right and wrong because I never really saw things in such simplistic terms. A Separation is about what it means to be human, to be flawed, to have the ability or inability to love and respect and communicate. A Separation is essential, masterful cinema. I loved A Separation. I gave it 4.5out of 5 The reason I love foreign film is to see how familiar situations can play out differently in other cultures. Check out Farhadi's following film, The Past. Similarly deals with relationship issues (marriage/divorce/kids). Very good. Exactly Nathan, you said it perfectly. I found it fascinating to see a familiar moral dilemma, the concept of truth or lies when charging someone with a crime, but adding the devoutness of their religious beliefs into the mix. Personally I would struggle with that situation just because of a basic understanding of right and wrong, but when you truly believe it is a practically unforgivable sin? Really compelling stuff. I am familiar with The Past and I almost took it from the library, but for some reason I felt like I had to see A Separation first, so now I will make sure to check it out. I saw in an interview once that George Lucas said he set up the Cantina scene in Star Wars like his experiences with foreign film. The viewer is thrown into a scene that is completely out of their own experience, but normal to that culture, and they have to try and figure out what is going on. That sense of confusion puts you in Luke's shoes.